I have to admit, Ron Howard may have perfected the art of film. Although he isn't as experimental as David Lynch or as eccentric as Terry Gillam, he has managed to make a good living out of tried and tested techniques pioneered by established and acclaimed film legends such as Steven Speilberg and Stanley Kubrick. The result is a string of movies with a combination of great talented actors and an engaging story. Although you can regard almost all of his movies as 'commercial', he has made a great career out of being a loyal trooper of the Hollywood system, His name has always been associated with mainstream cinema and things look like it will stay that way. 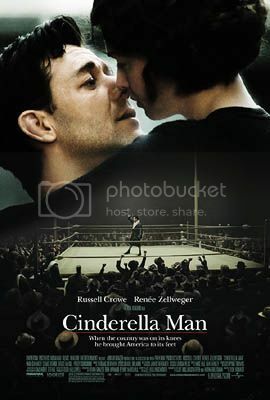 Cinderella Man is the story of boxing legend James J. Braddock (Russell Crowe) set in New York during the era of tne Great American Depression of the 1930's. Braddock tries to make ends meet working at the docks to support his family and wife Mae (Renee Zellweger) after losing his boxing license due to a no contest fight (which drives boxing audiences out of the bowls) caused by a hand injury. His escalating poverty drives him to send his children out to their in laws and eventually ask for government support and a 'handout' form his former colleagues in one of the more heartbreaking scenes in the movie. 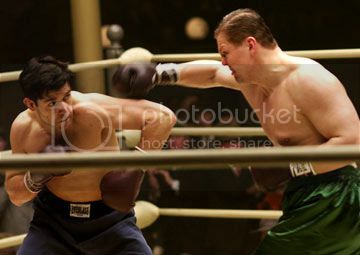 He then gets a break when his manager Joe Gould (Paul Giamatti) pulls out a deal for him to replace an injured fighter. Braddock wins by knockout surprising everybody and inspiring the rest of the American east with his charisma and fascinating history. The movie prtrays Braddock as an honest hardworking man who would rather get hurt and beaten to a pulp for money rather than steal. This story gets to the rest of America and elevates him to role model/icon. Russell Crowe is definitely one of the best actors of out time. His recent behavior offscreen (like that phone-tossing incident with a hotel clerk) has moved people to regard him as a troublemaker. But that doesn't mean the guy can't act. He's got the Brooklyn accent and swagger down to a T and so did Renee Zelwegger. I am particulary proud of Paul Giamatti's consistent performances, definitely one of my favorite character actors. I would like to single out the performance of Paddy Considine (from In America and My Summer of Love) as a Brooklyn docker and friend to Braddock. This guy's got some real talent and I'd love this guy to be seen in more movies in the future. The fight sequences were particulary intense and brutal, but pale in comparison to Crying Fist. Howard really utilizes the THX features of the theater with the 'boom' of every upper cut. Other than that, nothing else we haven't seen in Ali, really. Although I can say that this may not be Howard's best movie, but it still delivers the family-friendly message of hard work and not giving up when your chips are down and all that stuff. 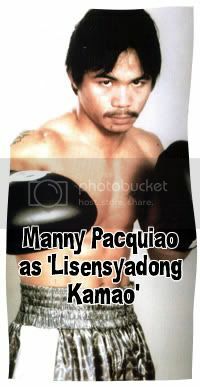 I'm now waiting for the Manny Pacquiao remake. Shrinks everywhere may soon be out of jobs if blogging continues to gain popularity. Blogs are like children. You love them and nuture them and hope that they turn out alright. It appears you have done that with your blog! Great work! I have a golf drivers site. It pretty much covers golf drivers related stuff. Allan: Oo, nga no? Oscar fodder nga yang triumph-of-the-human-spirit stories na yan eh. This is based on a true story, although, thankfully, Howard doesn't come right out and say it. I am very much curious about this film. Going to watch it tonight again.